In honor of the Holiday catalog launch tomorrow, I have a little sneak peek for you using some of the really awesome new products! Honestly, I haven't been so excited about a holiday catalog EVER! There are so many cute things in this one...my wish list is huge! 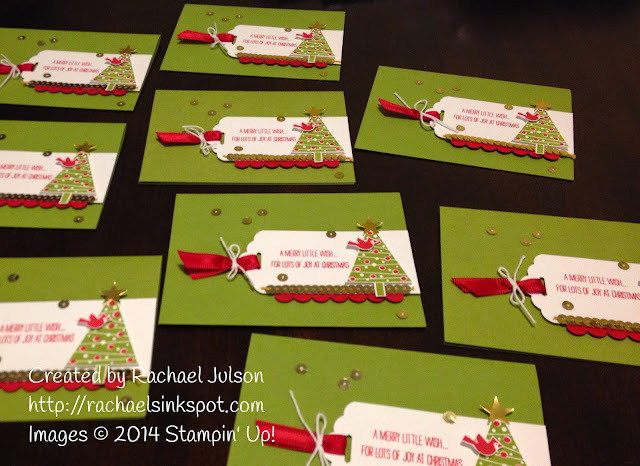 This card uses the new Festival of Trees stamp set and matching Tree Punch (available as a bundle). The stamp set is one of MANY photopolymer sets in the new catalog, and since it's photopolymer, it's perfect for two-step stamping. The tree is stamped with Old Olive, and the ornaments are a separate stamp that was inked in Real Red. Because the stamps are completely clear, it was a breeze to line everything up! It's been awhile since I used my Scallop Tag Topper Punch. I missed it! It was just what I needed to create the tag to mount the tree on. See that adorable little bird? I "fussy cut" those with my Paper Snips. Isn't it so sweet? 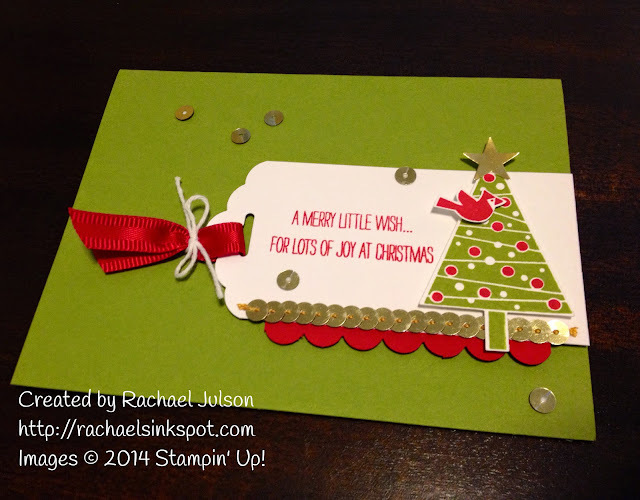 I am participating in a Stampin' Up! demonstrator swap and this is one of my entries, which means I made several of them to swap. In exchange, I will receive the same number of cards back. I can't wait to show you my other swap project, and share with you the amazing projects I get back from the other demonstrators!